This article is about the Cincinnati neighborhood. For the Ohio-based band, see Over the Rhine (band). 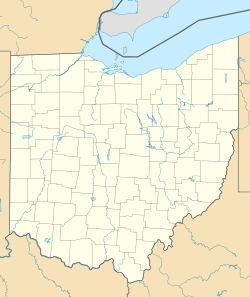 Over-the-Rhine (often abbreviated as OTR) is a neighborhood in Cincinnati, Ohio . Historically, Over-the-Rhine has been a working-class neighborhood. It is also believed to be one of the largest, most intact urban historic districts in the United States. The neighborhood's distinctive name comes from its builders and early residents, German immigrants of the mid-19th century. Many walked to work across bridges over the Miami and Erie Canal, which separated the area from downtown Cincinnati. The canal was nicknamed "the Rhine" in reference to the river Rhine in Germany, and the newly settled area north of the canal as "Over the Rhine". In German, the district was called über den Rhein. An early reference to the canal as "the Rhine" appears in the 1853 book White, Red, Black, in which traveler Ferenc Pulszky wrote, "The Germans live all together across the Miami Canal, which is, therefore, here jocosely called the 'Rhine.' " In 1875 writer Daniel J. Kenny referred to the area exclusively as "Over the Rhine." He noted, "Germans and Americans alike love to call the district 'Over the Rhine.' " The canal was drained and capped by Central Parkway, the resulting tunnel was to be used for the now defunct Cincinnati Subway project. Built in the nineteenth century during a period of extensive German immigration, Over-the-Rhine changed as many residents moved to the suburbs following World War 2. The city and area had lost many of the industrial jobs which once supported its workers. By the end of the century, the area was notable for the poverty of remaining residents. In this time period residents united and created many life-saving organizations. Following social unrest in 2001, the neighborhood has since been the focus of millions of dollars of redevelopment. Over-the-Rhine is one of the largest, most intact urban historic district in the United States. Because of its size, Over-the-Rhine has several distinct districts. OTR is bisected by Liberty Street. The Northern Liberties and the Brewery District are north of Liberty Street. South of Liberty are the Gateway Quarter and Pendelton. In recent years developers have renamed this portion of Over-the-Rhine to "The Gateway Quarter". This area has been the focal point of gentrification, which has been controversial due to the displacement of African Americans and low income residents. A comparison of the 2010 and 2000 federal censuses shows that over 1000 African Americans left this area during the decade. As of 2016, this is a primarily white, wealthy and exclusive section of the neighborhood. The area north of Liberty street was the heart of Cincinnati's beer brewing industry. Christian Moerlein established his first brewing company in Over-the-Rhine in 1853. Eventually the Christian Moerlein Brewing Co. became the city's largest brewery and expanded into the national market. At its height the brewery occupied three entire city blocks. Prohibition brought an end to the company in the 1920s. In 2010 the revived Christian Moerlein Brewing Co. began brewing beer in the Brewery District once again. This area of the neighborhood has been relatively untouched by recent gentrification efforts and may resemble historic OTR better than other areas, though future investment may change this space in the future. Until 1849, today's Liberty Street, then called Northern Row, was the corporation line forming Cincinnati's northern boundary. The area north of Northern Row was not subject to municipal law and was, appropriately, called 'The Northern Liberties'. In 1955, the city decided to widen Liberty Street to connect with Reading Road as an east-west cross town access point for the interstate highway system. Buildings on the south side of the street were demolished and the street was widened from a two lane road to one with five lanes. Efforts are underway to narrow Liberty Street to bridge the gap between these halves of the neighborhood. The neighborhood of Over-the-Rhine has been the location of heightened gentrification efforts for the city of Cincinnati. The neighborhood of Over-the-Rhine was once the most dangerous neighborhood to live in 2009 , which had not been the same since the infamous 2001 Cincinnati riots. Following these events, the combination of private development corporations and the political backing of city officials have begun to address the problems that come with a neighborhood with low employment and high crime rates. The political dimension of Cincinnati is important to examine in order to highlight the changes made to the neighborhood of Over-the-Rhine. A neo-liberalism approach is used in the city's urban renewal strategy by utilizing private corporations rather than the city itself to take on renewing and updating this particular area. The governments role in promoting economic development has transformed from a regulator of development to a facilitator of development in that it oversees and helps put development corporations in the best place to create effective change in these lower occupation, high crime neighborhood like Over-the-Rhine. The Cincinnati Center City Development Corporation, a private development corporation whose mission "is to strengthen the core assets of downtown by revitalizing and connecting the Central Business District and Over-the-Rhine"  took on the majority of the task to turn this neighborhood around. Former Cincinnati Mayor, Charlie Luken was one of the founders of the group after realizing city officials were not creating policies that could turn around the area. The 3CDC is unlike other development corporations in that it doesn't act as the liaison for the city, but is instead the main developer with full political and financial backing by the city. The Cincinnati Center City Development Corporation (3CDC) has invested more than half a billion dollars into Over-the-Rhine in the form of purchasing 131 different historical buildings in addition to building 48 new ones. In order to put more money into future projects Charlie Luken and the 3CDC spur future investments by teaming up with Proctor & Gamble, a large corporation headquartered in Cincinnati. Proctor & Gamble would then kick in an additional $50 million dollars in addition to the 3CDC seeking assistance in the form of federal tax credits. The city of Cincinnati and Over-the-Rhine qualified for the New markets Tax Credit that would spur investment and incentive community development and economic growth through the use of tax credits that attract private investment to distressed communities . Through these processes the 3CDC has received praise from across the city and by several city officials who have thrown their support behind the group. However, this has not been the case overall in terms of the public perception of turning around Over-the-Rhine. The 3CDC says its main goal is to "create a more economically and racially diverse community that can be sustained over the long term." This however is not the case, from 2010 to 2014 the neighborhood went from 60% black to 66% white in the most developed parts of the neighborhood. The still underdeveloped and untouched parts of Over-the-Rhine have not seen rampant changes such as these and has remained over 80% African-American. Many feel displaced with the closing of vital businesses like corner store markets, laundromats, and even basketball courts. Instead, these location are replaced with high end bars and restaurants that many of these lower income residents have no use for. Over-the-Rhine and its developers are still in pursuit of attaining a more diverse economic and racial community through devoting resources to similar causes. $43 million has been allocated to improving homeless shelters around the area as well as securing financing for low-income and subsidized housing while also building mixed income projects throughout the area. Most of Over-the-Rhine's ornate brick buildings were built by German immigrants from 1865 to the 1880s. The architecture of Over-the-Rhine reflects the diverse styles of the late nineteenth century—simple vernacular, muted Greek Revival, Italianate and Queen Anne. Most of the buildings in Over-the-Rhine are one of these styles, but there are other odd balls as well. Art Deco is represented by the American Building on Central Parkway, the Germania Building at Twelfth and Walnut streets is ironically one of the few examples of German ornamentation in the neighborhood, Music Hall's mixture of styles is best described as Venetian Gothic, there are a handful of buildings with Gothic architecture, and the new SCPA on Central Parkway is the most notable example of Modern architecture in the neighborhood. Elaborate ornamentation of an Elm Street building. Rounded window cornices are a common feature of Italianate architecture. Italianate greystone at Clay and 13th Streets. Noted Indianapolis architect Evans Woollen III and his architectural firm of Woollen, Molzan and Partners were involved in the redevelopment of the historic neighborhood in the 1970s and 1980s. Woollen designed the Over-the-Rhine Pilot Center (1972–84), a group of four modern, mixed-use buildings within a two-block area. The Pilot Center buildings included a recreational center, a senior citizens center, a Montessori school and daycare center, and a meeting and event space. Funding for the $2.5 million project came from the U.S. Department of Housing and Urban Development. A comparison of a section of Vine Street from 2009 and 2013. In 2011 the Over-the-Rhine Foundation, which works to prevent historic building loss in OTR, won third place in the National Trust for Historic Preservation's nationwide "This Place Matters" community challenge. In 2006 the National Trust for Historic Preservation listed the status of Over-the-Rhine as "Endangered." Since 1930, approximately half of Over-the-Rhine's historic buildings have been destroyed. More will follow unless currently deteriorating buildings are repaired. Between 2001 and 2006, the city approved more than 50 "emergency demolitions," which were caused by absentee landlords' allowing their buildings to become so critically dilapidated that the city declared them a danger to the public. Reinvestment could have saved them. Due to the situation, the National Trust for Historic Preservation declared Over-the-Rhine one of Eleven Most Endangered Historic Places in 2006. Over-the-Rhine was included in the 2008 book, Frommer's 500 Places to See Before They Disappear, which noted the district's "shocking state of neglect". According to WCPO in 2001, some of the worst-kept properties at the time were owned by Over-the-Rhine's non-profits, which let the buildings sit vacant and deteriorating because of lack of funds or volunteers. With some buildings on the verge of collapse, investors and real-estate developers are trying to restore them before deterioration to the point of requiring demolition. According to the U.S. Census Bureau in 2010, part of Over-the-Rhine had one of the highest rates of abandoned and vacant homes in the country. They classified it then as the sixth hardest area in the nation to get an accurate population count. In recent years there has been a burst of restoration and development slowly moving northward year by year from Central Parkway, with a focus on attracting local small businesses rather than national chains. Developers have restored and renovated the abandoned buildings, the city renovated nearby Washington Park, and businesses and residents have moved into what were abandoned spaces. Local chefs and artisan brewers in particular embraced the area, and in 2018 Food & Wine Magazine called it "one of the country's most promising food scenes." The amount of serious crime in Over-the-Rhine (blue) has decreased since 2006, but crime still remains higher than the citywide neighborhood average (red). The number of serious crimes committed in OTR has decreased significantly in recent years but still remains significantly higher than the citywide average. In 2001 there were an estimated 500 vacant buildings in Over-the-Rhine with 2,500 residential units. Of those residential units 278 were condemned as uninhabitable. Also in 2001 the owner-occupancy rate was between 3 and 4 percent compared to the citywide rate of 39 percent. According to the "Drilldown", a comprehensive analysis of the city's actual population and demographics conducted in 2007, OTR's current population was just 4,970 people. As of the census of 2000, the racial makeup of Over-the-Rhine was 19.4% White, 76.9% African American, and less than 4% of other races. 0.6% of the population were Hispanics or Latinos of any race. The neighborhood's residents comprise roughly 1.2% of the population of the City of Cincinnati. Recent gentrification has changed the demographic makeup of the area as residents moving in tend to be higher income and are more likely to be white. By 2018 the website statisticalatlas.com was estimating OTR's population to be 34% white and 54% black, with 56% of those between the ages of 20 and 24 being white. In the movie Ides of March, George Clooney plays a politician who campaigns at Memorial Hall in Over-the-Rhine. In the movie Traffic (2000), the teenage daughter of the US drug czar becomes addicted to heroin and goes to Over-the-Rhine for drugs. Harry's Law (2011), an NBC legal comedy-drama, is set in Over-the-Rhine, though only old stock photos are shown. No filming was done in Over-the-Rhine or Cincinnati. Little Man Tate (1991) was filmed in Over-the-Rhine as well as various other Cincinnati locations. A Rage in Harlem (1991) was filmed in Over-the-Rhine because it resembled 1950s Harlem. In Eight Men Out (1988) scenes depicting Chicago in 1919 were shot in Over-the-Rhine. Over-the-Rhine and other nearby neighborhoods are featured in the 3 Doors Down music video It's Not My Time. In the seriocomic American novel A Deserted Place, by Keith Brabender, the artistic community in Over-the Rhine is featured and contrasted against the religious suburbs of Cincinnati. In music, the folk-rock group Over the Rhine took its name from the Cincinnati neighborhood, where the band first started in 1989. Cincinnati-born vocalist Matt Berninger references the neighborhood in the lyrics of the 2015 EL VY song "I'm the Man to Be." Most of Over-the-Rhine's landmarks are related to the arts and are clustered in one area near Downtown. Art Academy of Cincinnati, founded in 1869, is a four-year arts college with its campus centered around 12th and Jackson streets. Cincinnati Music Hall, built in 1878, is a concert theatre that hosts the Cincinnati Opera, the Cincinnati Symphony Orchestra, the Cincinnati Pops Orchestra, and the Cincinnati May Festival. Emery Theatre was built as the original home of the Cincinnati Symphony Orchestra. Famous conductor Leopold Stokowski considered its acoustics comparable to Carnegie Hall. It is currently closed for renovations. Ensemble Theatre of Cincinnati In Over The Rhine since 1988, a theatre that presents new works and works that are new to the region. Findlay Market is the oldest continuously operated public market in Ohio. It is also the site of special events and a farmers' market. Know Theatre of Cincinnati a theatre that produces contemporary theatre with new works and regional premeieres. Know Theatre produces the annual Cincinnati Fringe Festival - the largest performing arts festival in Cincinnati. Memorial Hall is the home of the Cincinnati Chamber Orchestra, the progressive MusicNow festival, and the American Classical Music Hall of Fame and Museum. School for Creative and Performing Arts is the first K-12 selective arts school in the United States. In 2009 the school was the subject of the MTV reality television series Taking the Stage. Washington Park, the second oldest park in the city behind Piatt Park, originally established as a burial ground for several small churches. Over-the-Rhine Community Housing - Formed in April 2006 by the merger of two organizations supporting affordable housing. Drop Inn Center a homeless shelter which offers chemical dependency treatment. Removed from neighborhood October 2015. Greater Cincinnati Coalition for the Homeless is an advocacy organization started in 1984 to advocate for people experiencing homelessness, affordable housing, and other solutions to eradicating homelessness. Over-the-Rhine Foundation, works to protect OTR's endangered historic structures, preserve its cultural heritage, and promote a physically and socially sustainable neighborhood. Brewery District Community Urban Redevelopment Corp. works to develop the northern half of the neighborhood, with an emphasis on OTR's brewing heritage and the mixed-use neighborhood created by use of the nineteenth-century brewery building stock. Cincinnati Center City Development Corporation Public funding to rehabilitate and renovate city structures. Over-the-Rhine Community Council - Since 1970, the council has represented the interests of residents and partnered with other organizations in service to our neighbors in our unique, historic neighborhood. Levi Coffin, "President of the Underground Railroad"
Ronald Howes, American toy inventor, created the Easy-Bake Oven. ^ a b c d National Park Service (2007-06-30). "National Register Information System". National Register of Historic Places. National Park Service. ^ a b c Over-the-Rhine Foundation. Guide to OTR Architecture. Accessed on 2009-08-13. ^ Kenny (1875), pg. 130. ^ Pulszky, Francis; Theresa Pulszky (1853). White, Red, Black: Sketches of American Society in the United States. New York: Redfield. p. 297. ^ Kenny (1875), pg. 129. ^ a b Skirtz, Alice (2012). Econocide: Elimination of the Urban Poor. NASW Press. ISBN 978-0-87101-424-5. ^ Newberry, Jon (2010-12-17). "Christian Moerlein brews new 'Arnold's' beer in OTR". ^ "Liberty Street Road Diet — UrbanCincy". ^ a b "How Cincinnati Salvaged the Nation's Most Dangerous Neighborhood". POLITICO Magazine. Retrieved 2018-11-27. ^ Addie, Jean-Paul (2009-09-01). "Constructing Neoliberal Urban Democracy in the American Inner-city". Local Economy. 24 (6): 536–554. doi:10.1080/02690940903314944. ISSN 0269-0942. ^ "ABOUT". 3CDC. Retrieved 2018-11-29. ^ a b Jean-Paul, D Addie (November 2008). "The Rhetoric and Reality of Urban Policy in the Neoliberal City: Implications for Social Struggle in Over-the-Rhine, Cincinnati". Environment and Planning A. 40 (11): 2674–2692. doi:10.1068/a4045. ISSN 0308-518X. ^ a b Deobhakta, Shireen (August 2014). "Analysis of social costs of gentrification in Over-the-Rhine: a qualitative approach". University of Louisville Institutional Repository. ^ "New Markets Tax Credit Program". www.cdfifund.gov. Retrieved 2018-11-29. ^ a b c d MAAG, CHRISTOPHER (November 25, 2006). "In Cincinnati, Life Breathes Anew in Riot-Scarred Area". New York Times. ^ OTR Foundation Why OTR Matters. Accessed on 2010-08-13. ^ a b c Over-the-Rhine Foundation. Historic Preservation. Accessed on 2009-08-13. ^ a b c d National Trust for Historic Preservation, 11 Most Endangered: Over-the-Rhine Neighborhood. Accessed on June 13, 2009. ^ Philip J. Trounstine (May 9, 1976). "Evans Woollen: Struggles of a 'Good Architect'". [Indianapolis] Star Magazine: 23. ^ "Pilot Center Filling in Over-the-Rhine". Architectural Record. 158 (5): 81. October 1975. ^ "2011 This Place Matters Community Challenge". National Trust for Historic Preservation. Retrieved July 20, 2011. ^ "Now, not soon, is the time to save OTR's historic treasures". Cincinnati Enquirer. January 14, 2010. Retrieved February 26, 2010. ^ Hughes, Holly; West, Larry (2009-01-29). 500 Places to See Before They Disappear. Frommer's. pp. 346–47. ISBN 978-0-470-18986-3. ^ "OTR, West End a quagmire for census". Cincinnati Enquirer. March 1, 2010. Retrieved 2010-03-14. ^ Woodard, Colin. "How Cincinnati Salvaged the Nation's Most Dangerous Neighborhood". Politico. Retrieved 14 June 2018. ^ Landsel, David. "This Midwest Neighborhood Is Home to One of the Country's Most Promising Food Scenes". Food and Wine. Retrieved 14 June 2018. ^ "Cincinnati Neighborhood Market DrillDown" (PDF). Social Compact Inc. June 2007. Retrieved 23 December 2011. ^ Swartsell, Nick. "The Ollie's Trolley mural at Liberty and Race streets will come down to make way for building improvements and a new bar". City Beat. Retrieved 14 June 2018. ^ Kiesewetter, John (January 17, 2011). "Laying down the 'Harry's Law'" (Press release). WCPO. ^ William Horberg (November 7, 2008). "The Last Chester Himes Movie? pt 2". Typepad. Retrieved 2010-11-05. ^ "FAQ - over the Rhine". ^ Art The Academy of Cincinnati. About The Art Academy of Cincinnati Archived 2009-09-04 at the Wayback Machine. Accessed on 2009-08-23. ^ "$3 Million Projected to Reopen the Emery Theatre" (Press release). Emery Center Corporation. October 29, 2008. Retrieved December 7, 2008. ^ Gelfand, Janelle (August 31, 1999). "Emery fix-up in the wings : Team works to bring 1911 gem into the 21st century". Cincinnati Enquirer. Retrieved July 10, 2008. ^ Findlay Market. About Findlay Market. Accessed on 2009-08-23. ^ Findlay Market-Historic renovated Cincinnati Public Market and Farmers Market Corporation for Findlay Market, 2007. Accessed 27 May 2007. ^ School for Creative and Performing Arts. The New SCPA. Accessed on 2009-08-23. ^ "Our Daily Bread Soup Kitchen & Social Center". ^ Horstman, Barry M. (2010-02-19). "Ronald Howes, inventor of Easy-Bake Oven, dies at 83". Cincinnati Enquirer. Archived from the original on 2010-02-23. Retrieved 2010-03-04.